You know I try to avoid showing faces on PDP and especially the ones of children. But in this photo I don't think any of the kids are recognizable, and the one leaning on the windows looks so fascinated that I don't resist posting it! 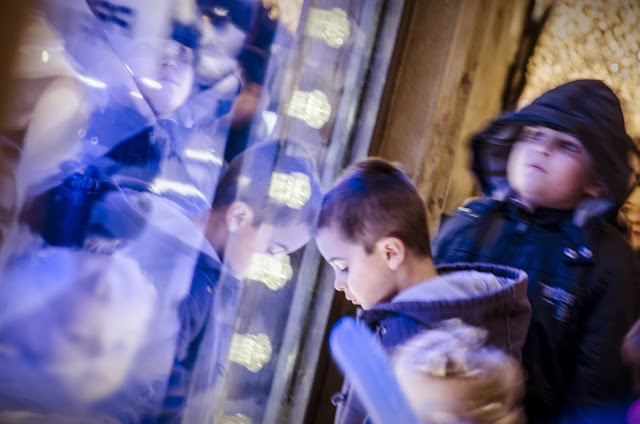 I took it at Le Printemps, where, like every year, they have beautiful Christmas windows that children love (I remember how much I used to love this when I was a kid!) . I thought this was a cool way of starting the week. It's a good shot, Eric... really draws the eye. Aside from people in crowds, I have yet to be in a position where photographing children would be an issue... but I share the hesitation to do so. Your ability to capture that moment of transfixed fascination is wondrous in this image. Kudos! I took about a zillion pictures of these windows—and none as good as this. Love the reflections! Merci Alexa. I've been lucky once again. My parents used to drive us from our small town to Chicago every Christmas so we could view the windows at Marshall Field's. Magical. Extraordinaire ... ! J'entends, avec les yeux, tout autour le bruit, les klaxons, les voix, l'ambiance joyeuse, mêlés aux lumières, néons et reflets et je vois tout ce que le temps suspendu, le temps d'une photo, nous dit de l'histoire, un après-midi dans la tête d'un jeune garçon, devant une vitrine de Noël au Printemps. Il se rappellera, de manière diffuse peut-être, mais quand même, plus tard, un jour, sans doute. J'aimerais qu'il ait cette photo comme souvenir de lui, un instant suspendu, un instant de photo génial. Depuis qu'on vit avec des smartphones scotchés dans la main, on fait tous des photos de nos enfants, de tout, et de n'importe quoi, mais rien ne vaut de belles photos. Avec de vrais appareils photos et du talent. Et du temps. Je crois que c'est ça. Yelp reports the building as closed. It's so huge and glorious, I can't imagine any one company occupying it in this economy (except a bank! ).